Forest degradation in Pakistan has negatively impacted communities, ecosystems, and biodiversity. As forested areas shrink, their attendant resources also disappear. However, unsustainable forest management practices and a high dependency of local communities on forests for meeting a wide variety of needs - including timber, firewood, fodder for livestock, agricultural land, and non-timber forest products including wild fruits and medicinal plants - often results in deforestation and degradation of forest ecosystems. Individual communities within Pakistan are comprised of diverse ethnicities, gender identities, and socioeconomic classes. As a result, communicating ideas and encouraging participation in the plantation and management of forests requires a deft hand and a variety of approaches. Forest management in Pakistan is decentralised, but local communities understand that forest management directly benefits people and the environment, and that co-operation is therefore vital. In recognition of the significance of Pakistan’s forest ecosystems, and realising the need for practicing sustainable forest management, the Sustainable Forests Management (SFM) Project was launched as a joint venture financed by the Global Environment Facility (GEF) through UNDP, and implemented by the Ministry of Climate Change through provincial forest and wildlife departments in Sindh, Khyber Pakhtunkhwa, and Punjab provinces. The project promotes sustainable forest management in Pakistan's Western Himalayan Temperate Coniferous, Sub-tropical broadleaved evergreen thorn (scrub), and Riverine forest types, for biodiversity conservation, mitigation of climate change, and enhancement of ecosystem services for local communities. The SFM Project contributes to the Pakistan Prime Minister's Initiative "Green and Clean Pakistan" by improving forest cover, protecting wildlife and their habitats, improving livelihoods in local communities, and improving forest planning and monitoring through a comprehensive capacity building programme. In the designated forest landscapes, the project recognised that finding solutions for fuel and water needs for the local community would transform how neighbouring forests are used. In order to support populations living near forest areas - particularly for women and girls tasked with collecting wood for fuel, and water for household and livestock needs - three natural springs were developed, and eight water ponds were rehabilitated to harvest the rainwater in scrub forests. Additionally, 90 gas cylinder and stove pairs were distributed among the communities living near the forest in selected project landscapes, and four bio-gas plants were installed to meet the local communities’ energy needs – obviating the need to collect firewood in an ever-expanding radius. ‘The biogas plant is a gift to me’, said Mrs. Shahnaz, a resident of Razi Jatoi village near the Kot Dhingano Forest in the Taluka Qazi Ahmed township’s environs. Mrs. Shahnaz, a mother of seven children, is a housewife who is responsible for making three meals a day for ten family members along with other household chores. Before the biogas plant, the household utilised firewood collected from the forest that is about 1.5 kilometres away from the village, supplemented with animal dung for cooking and heating purposes. Household members visited the forest daily to collect sufficient firewood – at least 15 to 20 kg - to cook three meals a day for their family. Shahnaz continues: ‘Making fire with wood and dung took hours if the wood wasn’t dry (particularly during the rainy season), and the smoke also hurt my eyes and lungs. But now it takes a minute to open the stove, and I can make a meal within less time and there is no smoke from it’. Managing the biogas plant is not difficult, and only requires the dung of six animals. She uses the dung of her four animals, and the rest is collected from the village by her children. She and her family are very happy with the new source of energy as it saves both time and energy. Through training workshops and courses, the project is working with local communities and provincial and district-level forest agencies to improve patrolling skills, enhance institutional capacity to fight fires, and promote sustainable land and forest management within key agencies and communities. With project support, six nurseries of indigenous plant species were developed for the reforestation of Riverine forests, Temperate Conifer forests, and Sub-tropical Broadleaved Evergreen Thorny forests. A total of 15,220 kg of various indigenous plant seeds have been collected for sowing in the upcoming season, which will also help realise carbon benefits. To date, 14,000 kg seed has been broadcasted over an area of 1,336 hectares. Further, 25,000 seedlings of various native species and 1,000 fruiting plants were distributed to locals during monsoon season around the riverine forest in Sukkur district. Through irrigation, bush fencing, and the development and clearance of compartment roads and wetlands, 741 hectares of land across two districts in Sindh province were restored. Additionally, approximately 200 hectares of degraded forest area were restored through dry afforestation techniques in Chakwal, Punjab. 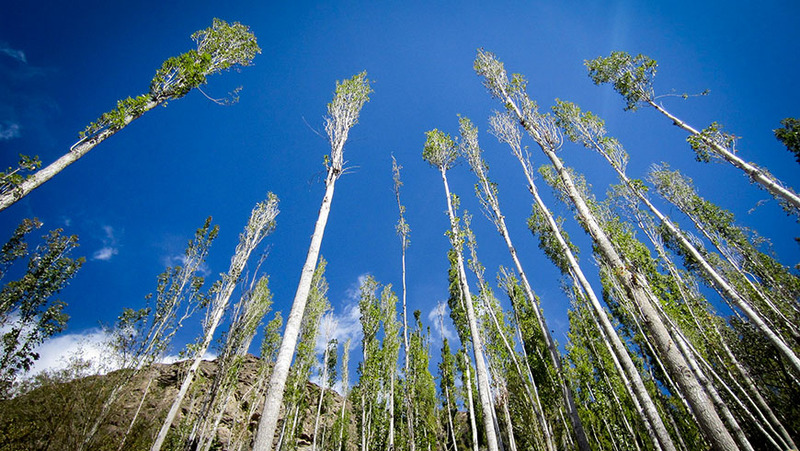 These project efforts support Pakistan’s broader ambitious goal to plant 10 billion saplings. What started in 2014 as the ‘Billion Tree Tsunami campaign’ - with the goal to restore previously deforested landscapes by planting 1 billion saplings - has been achieved and has now blossomed under Pakistan’s Prime Minister, Imran Khan and his new government’s aim to replicate that success nationwide, this time with a ‘10 Billion Tree Tsunami’. ‘This is one of the rare things in our society that is not divisive’, said Malik Amin Aslam, the new Federal Minister for Climate Change, who headed the original campaign in Khyber-Pakhtunkhwa. On September 2, 2018 when the government held 200 launch ceremonies across the country, enthusiastic citizens helped plant 2.5 million saplings in one day. We know that saving our forests will require all of us. Working with multiple partners, UNDP supports efforts to sustain resilient forest ecosystems to benefit local economies, protect biodiversity and address climate change by providing technical assistance, policy advice, and governance support to developing countries. Yielding multiple development benefits across multiple SDGs, these efforts are advancing Pakistan’s efforts to achieve SDG 1 on poverty, SDG 11 on sustainable cities and communities, SDG 12 on responsible consumption and production, SDG 13 on climate action, SDG 15 on life on land, and SDG 17 on partnerships for the goals, among others. Photos: UNDP Pakistan, Frida Bredesen and Usman Azher on Unsplash. For more information on the project, please visit: UNDP Pakistan Sustainable Forest Management project profile and project website: Sustainable Forest Management Project, Pakistan.